It’s here! Faster, easier, more profitable cloud for Telcos, MSPs, and other cloud service providers. OnApp v6.0 is available now. It’s the fastest, easiest and most profitable cloud platform for service providers. Faster: OnApp v6.0 automatically accelerates web applications your customers host in your cloud. Websites run faster on OnApp. Easier: OnApp v6.0 brings a range of new import, migration and export features, to make cloud easier to manage and deploy. More profitable: OnApp v6.0 adds new automation features and a brand new billing system: now it’s even easier to monetize your cloud. 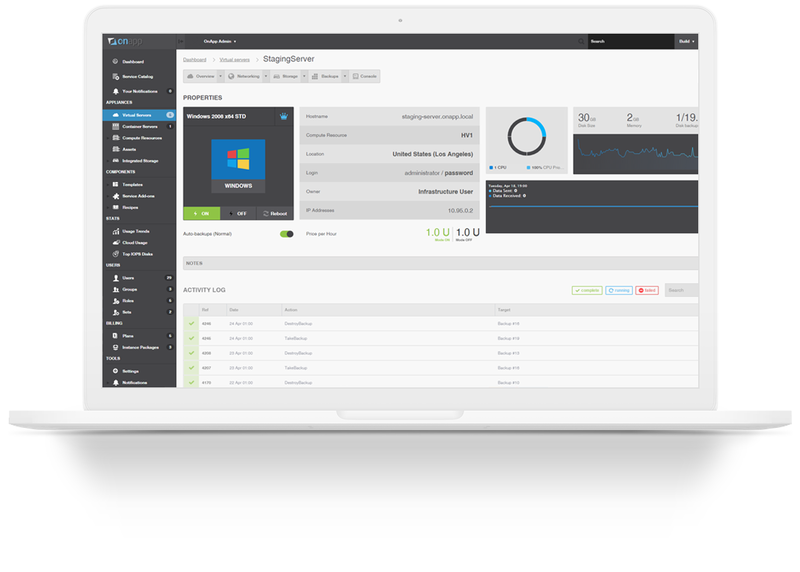 See what’s new for OnApp and VMware cloud providers. Free, automatic content acceleration for your cloud. Our new managed cloud service for Telcos and MSPs. What’s new in OnApp v6.0? A new system that replaces billing plans, and makes it easy to control access to cloud resources, and billing for cloud resources, in one place. OnApp v6.0 lets you decide exactly what to bill for (or not bill for), in any real-world or virtual currency, for any number of tiers of user, department or company – and then makes it easy to integrate usage and billing data with your billing or client management system of choice. OnApp v6.0 adds Software-Defined Networking, giving you the ability to manage networks using VXLAN technology across OnApp cloud compute resources. Now you can build level two network infrastructure with OnApp on top of existing IP (level three) networks. For VMware cloud providers, OnApp now brings its intuitive UI and enhanced automation and billing capabilities to VMware vCenter, complementing OnApp’s existing vCloud Director capabilities. OnApp transforms VMware vCenter into a secure self-service cloud, making it easy for VMware cloud providers to monetize their vCenter environments. OnApp v6.0 includes a new plug-in framework for specialist backup products, complementing OnApp’s range of native backup options. Plug-ins are available for Veeam and R1Soft. OnApp Accelerator delivers up to a 100% performance improvement for websites hosted in OnApp clouds, by automatically optimizing web content and distributing it to 20 locations on a global Content Delivery Network (CDN) managed by OnApp. Now this patented content optimization technology is available free in OnApp v6.0 – and we absorb the bandwidth costs. OnApp v6.0 also adds Web Application Firewall (WAF) and Let’sEncrypt support to OnApp’s CDN platform for service providers. OnApp v6.0 adds a range of automation features to simplify day-to-day management of virtual servers and workloads, and a new notifications system that simplifies the process of creating and sending alerts to cloud operators and cloud users, based on events and transactions taking place in OnApp clouds. OnApp v6.0 automates migration of virtual servers between compute nodes and zones, to help service providers maximize utilization and simplify cloud infrastructure management. OnApp v6.0 simplifies integration of OnApp clouds with your Business and Operational Support systems. OnApp’s detailed cloud metering and billing statistics can be exported for overall usage, per-user, per-user group and per-virtual server. OnApp v6.0 enables you to create virtual servers with multiple disks and network interfaces from OVA templates, making it easy to import workloads from other platforms into an OnApp cloud. OnApp v6.0 wraps up all of the edge release functionality we’ve added since v5.5, into a single production-ready Long Term Support release. For the full list of changes, check out the release notes. Request a free upgrade at the OnApp Support Portal. Choose your upgrade time, including out of hours. See the full list of changes in OnApp v6.0. We perform free upgrades from 08:00 GMT to 16:00 GMT, Monday to Friday. Please note that we deal with the upgrade queue sequentially, so your upgrade date may move if previous upgrades take less or more time than expected. If you require a specific date or time for your upgrade, including out-of-hours, you might like to try our scheduled upgrade service: we’ll upgrade your cloud at the time of your choosing, including out-of-hours. This is paid service that costs $1,500.